Hogarth paints Captain Coram with no aristocratic features but rather exudes good nature and his natural self-confidence. Coram is not painted in an especially fancy or noble costume instead he is shown in a resolutely plain, red coat. Hogarth was very excited about this specific work as he was keen to have one of his works permanently displayed in a public building advertising his skills as a portrait painter. 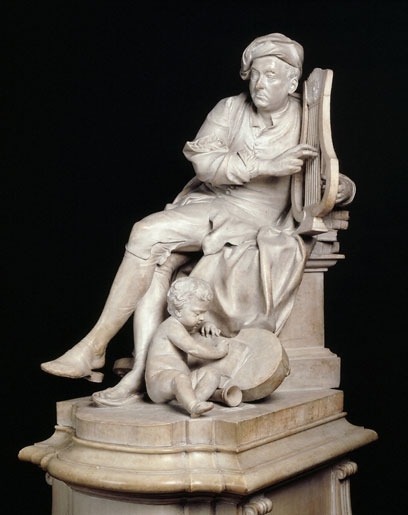 His inspiration for this work was Roubiliac's sculpture of the composer Handel, which was on display at Vauxhall Gardens, where Hogarth also had work. One of the techniques used by Hogarth in this piece was to focus on using primary colors, like the Italian masters of the Venetian school. In this case his focus is red and he can be seen to have used the color all over the work in various toned down streaks and dashes to draw attention to the central figure and create a sense of harmony in the piece. This can bee seen in the right side of the globe's reflection, the desk's hook and sky. Hogarth went on to create intricacy and variety in his work, by including a distant seascape of boats sailing over the sea and giving a panoramic view of the sunset. He also carries on the tradition of a heavy dark blue-green drape to the right which helps accentuate the bold red in the work and compliments the sea. The most striking color within this portrait is the deep red carmine which was muted down several tones to make it more natural and coherent with the natural light entering the composition from the nearby window. In fact many of the colors Hogarth uses are muted to blend in with the soft setting sun. Hogarth uses white and light grey to define light and shadow on the smooth and delicate surfaces. Other colors visible include yellow ochre, various light browns intermixed with blue-greens. Hogarth uses symbols that are well recognized to convey a sense of meaning and illustrate the character and purpose of the sitter. As a half-read book lies open at his feet next to the globe which sends a message to the viewer showing what a well read and educated gentlemen Captain Coram is. This symbols coveys his worldly knowledge in particular and his aspiration for more knowledge. Hogarth can be seen using his infamous Serpentine curve to lead the eye to the different objects in the work on both sides, as his coat leads us down to the globe and the other side accentuates the Royal seal of his Charter. This made the viewing process also more pleasurable as a whole without making it seem cluttered. This portrait is significantly different to others Hogarth produced, where he often layered the paint on the canvas very thickly and exploited the use of impastos upon the canvas to create depth and texture. The brush work here looks to imitate van Dyck, and is smooth and thinly applied. The colors were probably already mixed on the palette before being applied. For the seascape to the left he can be seen putting random lines over the grey-green evening sky but this created a more natural effect as embers of orange streak across the horizon. He paints the shirt and hair with more expressive strokes so it appears as light, natural and delicacy is remade on the canvas. Soft curves in loose detail create the illusion of bunched hair and lace cuffs. The white used for the orb and paper scroll are done in smooth streaks and dabbled where the surface of the object is hit by light. Hogarth uses freer strokes for the extravagant red coat; he uses the multitude of red tones to define shadow and depth, relaying on the rich use of the color to create texture.